Getting stuck behind one slow 18-wheeler passing another on the freeway made me wonder whatever happened to this year’s proposal to raise the speed limit for trucks. We’ll get the answer to that question in a couple of months. 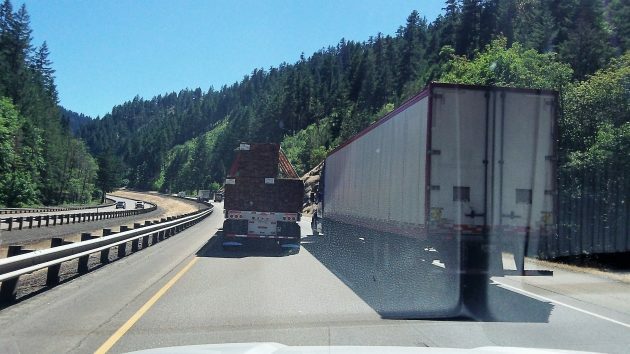 As you may recall, the Oregon Department of Transportation was looking into the possibility of raising the truck speed from 55 to 60 mph on I-5, on I-205 from the I-5 junction to West Linn, and on I-84 from Troutdale to The Dalles. This was in anticipation of possible action in the legislature. As it turned out, the legislature adjourned without doing anything about speed limits. But after a study and public meetings this past spring, the state traffic engineer recommended on June 1 that the truck speed limit be raised to 60 mph on all those freeway segments where the limit now is 65 mph for autos and 55 for trucks, except in the stretch through Roseburg. There, ODOT recommends that the limit be dropped to 60 for cars and kept at 55 for trucks. So now what? When I asked, Shelley Snow of ODOT Public Affairs told me that the Oregon Transportation Commission will take up the recommendation when it meets in Salem on Sept. 22. The commission may make a decision then or delay it to consider any additional information brought up at the time. Oops…too late. It just trotted out. There will always be those cars or trucks that want to travel a mile or two faster no matter the speed limit. Especially given the variance of indicated speeds of vehicle speedometers. If the OSP would just begin enforcing the speed “limit” as an absolute limit we wouldn’t have this problem. Every trucker knows the OSP will give them an extra 7 mph so they travel at 62,,, or so. And they pass each other at 62.5. This isn’t going to change by raising the limit 5 mph. The truckers will still pass at 0.5 mph more than the truck they are passing. Only enforcing absolute limits and prohibiting trucks from the left lane will come anywhere near solving this problem, and even then only on 6-lane or greater roads. How about an inland “trucks only” freeway to supplement I-5? Or maybe the inevitable arrival of robotic trucks which don’t have to be paid by the mile will do it. We already have one. It’s called the railroad and it reinforce the potential for the inter-modal hub prospects IMO.